Abstract: We explore the effective gain or loss in alpha from the point of view of the investor due to the volatility of a fund and its correlations to other asset classes. Fund managers and investors can be guided by this to increase the utility that is ultimately delivered to the investor. 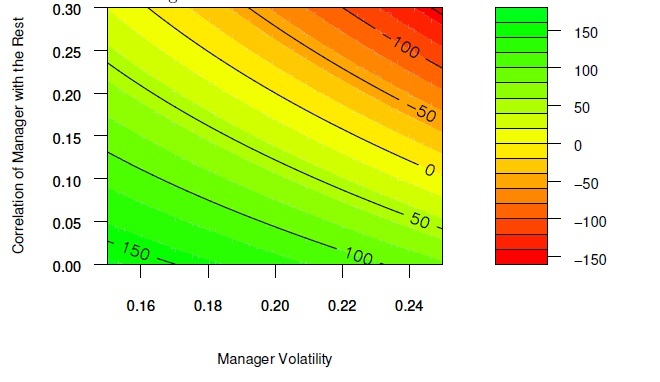 In this analysis of investor utility, the Sharpe ratio is shown to be misleading and the tracking error has no role at all. A new class of funds — called “hyperpassive” — is suggested which are similar to traditional index funds, but which aim to deliver a comparable expected return with less volatility than the benchmark. It is also shown that the optimal allocation to additional asset classes can be surprisingly high when the correlations are small. Accompanying software is available in the BurStFin package.